The Pacific Marine Mammal Center is fortunate to receive grant and foundation funding that allows us to satellite tag and track some of our released animals. Tags can provide us with important information: the movements and location of the animal, dive data (the depth and length of the dive), water temperature and salinity of the water. Other satellite tags just record the animal’s location. This scientific information is invaluable to our research regarding post-release monitoring, and provides PMMC with a small window into the intricate lives of our patients in their natural environment. 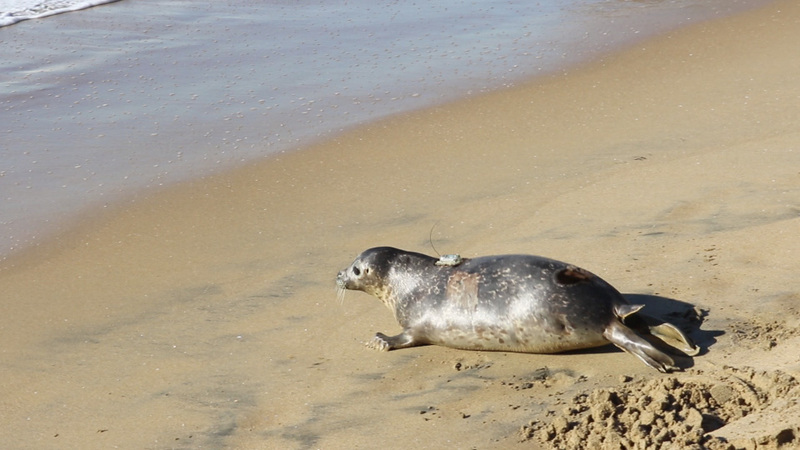 Each year, 6 to 8 animals are satellite-tagged and released by PMMC. The tracking device, either a splash or spot tag linked to wildlife computers, sends a signal for approximately 80 days to researchers at PMMC and to Robert DiGiovanni of the Atlantic Marine Conservation Society, our collaborating research organization, for analysis. Mr. DiGiovanni serves as Pacific Marine Mammal Center's chief scientist. On January 13, 2019 PMMC’s rescue team was sent out to Laguna Lido in Laguna Beach, California to assess an adult male sea lion that was entangled in fishing line. Due to his size and aggressive behavior, PMMC’s veterinarian deemed it necessary to sedate the animal on the beach for a safer rescue and transport. At 10:50 am “Breaking Bad” arrived at PMMC and was examined by the veterinary and animal care team. “Breaking Bad” weighed only 249.6 lbs (113.4 kg), was suffering from malnutrition (starvation), dehydration and was entangled in fishing line with multiple hooks all over his body. A male of his estimated age should weigh closer to twice Breaking Bad’s weight, and shouldn’t be entangled. Upon admission to rehabilitation, the medical team safely removed the fishing gear. He showed interest in fish right away and the team was able to begin fattening the emaciated adult male up. Foraging and eating fish on their is a major aspect in the rehabilitation process: the quicker the animals eat and gets to this stage, the quicker patients gain weight and are soon on their way back to their ocean home. After 1 month of rehabilitation, “Breaking Bad” weighed 360 lbs (163.3 kg). He was medically cleared, tagged in the front left flipper with orange Roto tag #W2103 and fitted with a satellite tag on his upper back. On February 13, 2019 “Breaking Bad” was released at Aliso Creek Beach, Dana Point, California. “Breaking Bad’s” satellite tag is a part of the continual post-release monitoring project between the Pacific Marine Mammal Center (PMMC) and the Atlantic Marine Conservation Society, and was made available by very generous donors to PMMC. The satellite tag will provide location data on “Breaking Bad”, salinity of the water, haul out times, and duration of “Breaking Bad”. Data collected from “Breaking Bad’s” tag will be compared with data from sea lions tagged since 2013 to determine if there are any similarities or differences in dive behavior, feeding patterns, use of habitat, and to assure that they become successful back in the natural environment. Oil rigs can be a popular spot for sea lions to rest. After a slow relaxing release on February 13, 2019, with rest breaks at camel point and 1000 steps beach, Breaking bad decided to move off the mainland head to the island of Catalina, spending a day just north of Avalon Bay. While here he was moving between the mainland island and the Avalon Knoll area, before heading around the south tip of the island on the 19th. At 5:00 pm on September 16th, 2018, PMMC’s animal care team was out in Dana Point harbor checking on a reported entangled sea lion. The animal was not located. However, as they were docking the boat, they were flagged down and informed that a small injured seal was in the parking lot. The team found the young injured harbor seal resting near the rescue truck. The team was able to carefully put the injured seal, nick named “Triscuit”, into a kennel and then into the rescue truck. Once back at PMMC, Triscuit was examined by the animal care staff. She was a mere 23.3 pounds and only 33 inches long. Triscuit was suffering from severe malnutrition, dehydration and had multiple wounds on her tiny body. Triscuit was discovered to be a re-strand, originally rescued by Sea World Rescue in June from Solana Beach. She was spotted multiple times at Children’s Pool, La Jolla before her rescue by PMMC. Triscuit was immediately started on a regimen of clear fluids, then gradually fish was added into the formula. After a few days of care, Triscuit began eating fish. Once this major step is achieved, most patients gain weight quickly and are soon on their way back to their ocean home. However, Triscuit hit a few obstacles, causing setbacks in her rehabilitation. The PMMC Animal Care patiently worked with Triscuit to complete her journey through recovery. While it took her a little bit longer, Triscuit finally began diving for fish in bigger pools and putting on much needed weight. After 2 ½ months, she was medically cleared to be released. Before sending her home, Triscuit was equipped with a satellite tag. This tag, provided by Anna Stokes, will allow scientists at PMMC collaborating with Scientists from the Atlantic Marine Conservation Society and Whale Net, to monitor Triscuit’s movements after her release. Triscuit was released at Irvine Cove, Laguna Beach California on December 7th, 2018, weighing 64 pounds. Triscuit’s satellite tag will not only assist scientists in tracking where she travels, but also provide them information on the environmental conditions in the locations in which she spends her time. This information will give a broader picture of changing parameters in the ocean. 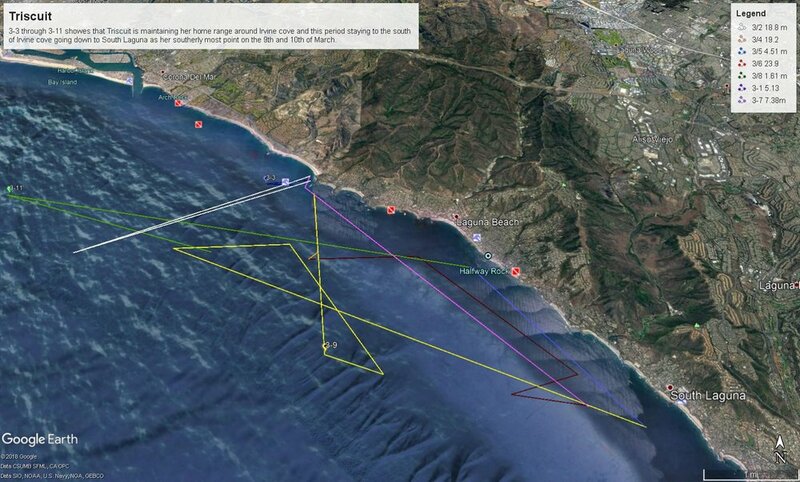 UPDATE 5 (1/29/19) 47 day update: Triscuit decided to leave La Jolla on Jan 17th and head north to the Laguna Beach/Newport Harbor area where she has been taking up residence since returning. She has visited her release location of Irvine Cove a couple of times swimming as far north as Newport Harbor area. Some interesting patterns can be seen in where Triscuit is spending a lot of her time that are becoming visible with more days of tracking. Notice that most of her paths are right at the edge of the canyons close to our shore. You can see on the 17th and 18th she appeared to be following the canyon off of Dana Point up to Laguna, then fast forwarding to the 25th of January and she appears to be at the edge of Newport Canyon, and on the 22nd, 23rd and 26th she was traversing the edge of the San Gabriel canyon, passing by Platform Ellen. These area are again highly productive area with great up-welling and perfect areas for Triscuit to be foraging/hunting in. Watching her traverse these areas coupled with the video and pictures we received of her in La Jolla at Children's Pool showing her in good body condition and alert and active point to her success at foraging. Stay tuned and let's see where Triscuit goes next- Back to La Jolla or somewhere new? We have now tracked Triscuit for 47 days and 795.44 miles. UPDATE 4 (1/9/19) 30 day update: Triscuit can now be deemed a successful reentry into the wild as she has cleared the milestone of being out back in her ocean home for 30 days. In the 30 day map, you can see the some distinct trends (see other updates). Triscuit mostly returned to her original area of Children's Pool/Seal Rock in La Jolla. She set up what appeared to be her home range here, slowing down to under 10 miles of travel a day and spending a lot of her time in and around the La Jolla Canyon, an area well known for its high productivity and one of the main reasons the seals and sea lions took back over Children's Pool. She surprised us all with a quick, 1 day trip to Mexico and spent time around the Coronado Islands. These Islands are known to have marine mammals in residence and just happens to be the islands that Melia, an adult California sea lion that was tagged in 1999 (photo below) and released from the Fort MacArthur's Marine Mammal Care Center in San Pedro CA, swam to after her release. Triscuit then returned to the La Jolla area on the 7th and has been there since. We have asked our scientists that are in La Jolla to be on the lookout for Triscuit and get pictures of her if she hauls out on/in children's pool. That way we will be able to get a visual on her and assess her physical condition. To date we have tracked Triscuit for over 30 days and in that time she has traveled 454.11 miles with a daily high of 77.1 miles and a low energy day of .4 miles. Now she has done a whole lot more swimming than that as we only see snapshots of her day due to programming of the sat tag to lengthen the life of the batteries in the sat tag (more location points and other data collected = less number of days of battery life). So, anyone up to walking or swimming 77 miles in one day? That would equal you swimming from Irvine Cove to Avalon and back, and that would only be 65.6 miles. You would still have to swim an additional 11.4 miles! Are you tired yet? UPDATE 3 (1/2/19): Triscuit is staying put in La Jolla, venturing out and around the area, she stopped by the beach below the South West Fisheries Center and traveled around the Scripts Pier. We shall see if she goes back to Children's Pool or ventures other places. She has not been more than 2.5 miles off shore in any of her recent travels. UPDATE 2 (12/31/18): After exploring Rancho Palos Verdes, Trump Golf Course and LA Harbor, Triscuit headed south not stopping until she arrived in La Jolla on December 28th . This is not a surprise as scientists and biologists had hypothesized that Triscuit would head back down to La Jolla. Since that day, she has returned to La Jolla Shores in the early morning hours after what appears to be foraging (hunting) runs out to the open ocean. Theses foraging runs have been between 4.5 to 6.2 miles in distance from the shoreline. Triscuit has also been to Children's Pool where her adventures began many months ago. We have alerted scientists at La Jolla to be on the look out for Triscuit so that we can get visual confirmation of her condition and the condition of her sat tag. UPDATE 1 (12/20/18): After spending time at the release area, Irving Cove, Laguna Beach, Triscuit appears to have traveled approximately 10.3 miles west into deeper waters, and returned on the 18th. She traveled approximately 4.25 miles and started a trip up north hugging the coast passing by Newport Harbor and Huntington Beach, before stopping and spending some time around the entrance of Anaheim Bay. 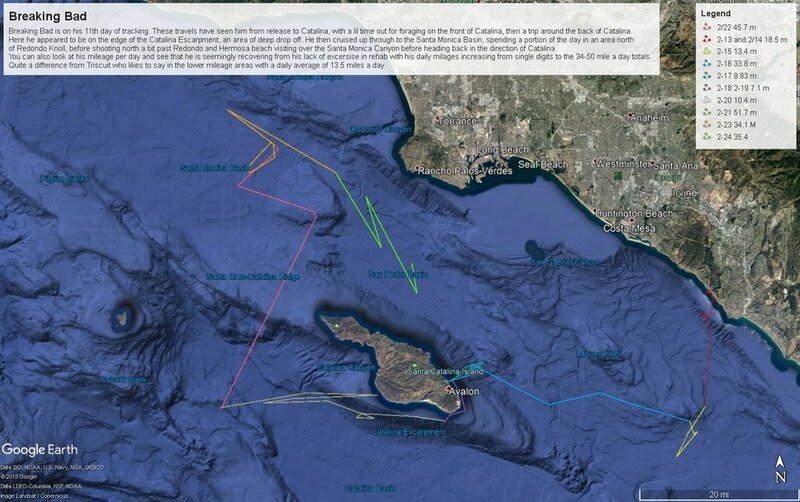 She then swam west past the Port of Los Angeles/Long Beach harbor, traveled some 36 miles off of Rancho Palos Verdes (approximately 18 miles off the shore of RPV). She then returned to Long Beach Harbor on the 20th of December. She appears to be on some exploratory trips during the day, perhaps to feeding areas and staying close to shore during the nights. Further collection of data and analysis will be needed to make further behavioral statements. We are receiving information daily and will continue to track where Triscuit travels. Raptor, a California sea lion pup, was rehabilitated for injuries sustained while depredating fishing lines and becoming entangled in the gear. He was found at Huntington Pier, a fishing hotspot, with one three prong and an additional single prong hook embedded in his jaw and tongue. Once sea lions learn to depredate fishing line, it often becomes part of their foraging repertoire and thus frequent areas around piers and elsewhere that fishing is popular. Because of this, after his rehabilitation, he was fitted with a satellite tag to monitor his movements and released at Aliso Creek Beach on Sept. 23, 2018. Raptor surprised us by leaving the coastline, traveling directly out to the Island of San Nicholas 104 miles away from the release point. Subsequently, he headed northwest to Trask Knoll and then south to San Nicolas Basin. Afterward, we tracked his movements west, to an area with outer seamounts before returning to the rookery on San Nicolas Island approx. 380 miles of travel in a short period of time. Shortly after, our ability to follow Raptor ceased. The tag was transmitting from a fixed point on the island, no longer moving. Channel Islands rangers were alerted to the tag’s location, but are not yet scheduled to go out to the island. We suspect the tag was detached from Raptor and have several theories as to how this might have happened. 1) When attaching a satellite tag to an animal, we try to use the least amount of glue necessary to minimize the tag’s footprint. We may have not attached the tag with enough glue resulting in it shedding off the animal more quickly than expected. 2) Young sea lions are highly social, frequently coming into physical contact with one another. If the glue was not sufficient and had loosened, the tag may have been pulled or rubbed off during bodily contact with other sea lions..
3) Raptor may have detached the tag himself by rubbing against rocks on the rookery. Finally, it is possible that Raptor could have expired on the island, however, given his health status 9 days earlier, we feel that his is unlikely, unless he had sustained a catastrophic injury. We look forward to recovering the tag and discovering whether it can give us any further indication of how and why it detached. The information we did collect for the duration Raptor was tagged allowed us further insight and data on the post release movements of our patients after rehabilitation. This has the potential to help us better understand their habitat, needs and ultimately improve our efforts in our effort to assist them. On May 28, 2017 PMMC’s rescue team was sent out to Camel Point in Laguna Beach, California to assess, and possibly rescue, a young sea lion. At 7:45am “Omaha” arrived at PMMC and was examined by the animal care staff. He weighed only 26 lbs (11.8 kg), and was suffering from malnutrition (starvation), dehydration and an injury to his right eye. After 3 months of rehabilitation, “Omaha” weighed 75 lbs (34 kg). He was medically cleared, tagged in the front left flipper with orange Roto tag #W1978 and fitted with a satellite tag on his upper back. On August 20, 2017 “Omaha” was released at Salt Creek Beach, Dana Point, California. “Omaha’s” satellite tag, part of the continuing post-release monitoring project between the Pacific Marine Mammal Center (PMMC) and the Atlantic Marine Conservation Society (AMCS), was provided by Mr.& Mrs. Stokes, very generous donors to PMMC. The satellite tag will provide location data on “Omaha,” as well as water temperature and the depth and duration of dives that “Omaha” makes. Data collected from “Omaha’s” tag will be compared with data from sea lions tagged since 2013 to determine if there are any similarities or differences in dive behavior, feeding patterns, etc. 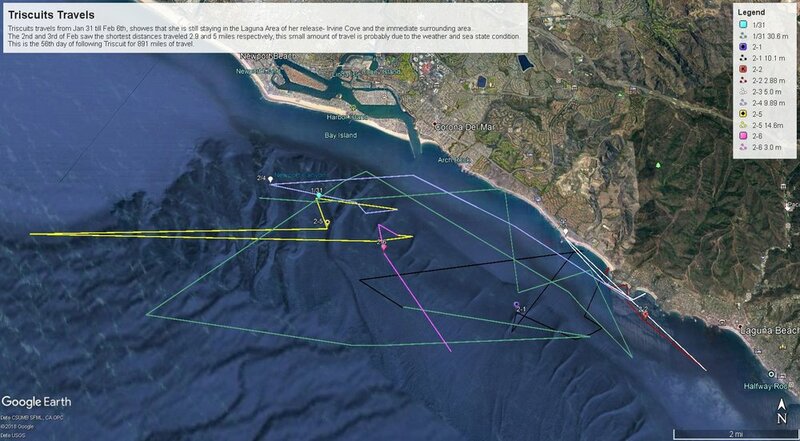 Omaha left Aliso Creek Beach, cruised south towards San Clemente, then back north to the release site. Omaha traveled to San Clemente Island where he has remained for a few days. Omaha seems to have settled on and around Carrington Point on Santa Rosa Island. Right off this point are some deep ocean trenches for good upwelling and hunting. Santa Rosa Island is part of the Channel Islands National Marine Sanctuary = smart sea lion! A young male harbor seal pup given the name "Quartz" originally came to Mystic Aquarium’s Animal Rescue Clinic on May 24, 2016. He was believed to have been abandoned shortly after birth. He was rescued in Scarborough, ME by the Marine Mammals of Maine before being transferred to Mystic Aquarium. During his 3-1/2 month stay, he received treatment for malnutrition as well as for a minor eye lesion. After what appeared to be a full-recovery, the 4 to 5 month old Quartz was released back to the ocean environment on Tuesday, September 13, 2016 at Blue Shutters Beach in Charlestown, RI. He was released with five other harbor seals. Before being released, Quartz received a flipper tag. This tag helped the Riverhead Foundation for Marine Research and Preservation, a rescue and rehabilitation organization in New York State, identify Quartz, who, unfortunately, was again in distress. Riverhead contacted Mystic Aquarium’s Animal Rescue Program, arranging for transport of Quartz back to the clinic to receive additional care. With records on file, Mystic’s animal care professionals had a better understanding of Quartz, his condition and treatment protocol. Upon re-admittance, Quartz was malnourished and dehydrated. He also received treatment for multiple wounds on his body and flippers. On February 3, 2017 following his second stay in Mystic Aquarium’s Animal Rescue Clinic, Quartz was released from a location known for its seal populations in North Kingston, Rhode Island.